Get 3 Estimates. Make us One. We are a locally owned and operated A+ Rated, Licensed and Insured roofing company with close to 20 years of experience. We offer a 10 year workmanship warranty with a full roof replacement and new construction. We specialize in roof replacement with complete tear-off. We provide service to the customer with simple leak repairs to major storm damage. We have many years of experience in working with various insurance companies to assist with your insurance coverage. We work with many builders in the area and will submit a competitive bid for your review. Whether your project is a garage, shed or playhouse, we do it all! Clean and secure all existing gutters/gutter toppers or replace with new. H AND S LLC provides the most comprehensive installation, repair, maintenance and consulting for your desired project outcome. 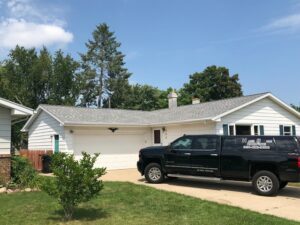 In business since 2000, our goal is to meet your roofing needs with the highest quality in customer service and satisfaction with attention to detail. As your contractor, we can help you when it comes to gutters, gutter covers, soffit and fascia, rubber roof/repair, chimney work, skylights and tunnels, and shingle repair. We have a convenient location consisting of a full time office staff, full showroom and experienced estimators. We offer full service to our customers from the time of the estimate to the completed project. We our committed to giving our clients the best price out of the gate to be competitive, responsible and professional with each estimate. We can set up appointments in office or at your home or a time that is convenient for you. We are available via email and in office to answer any questions you many have in a timely manner. We can assist with shingle brand and color selection to assure your satisfaction. Please call us today for a FREE and accurate quote. We Pride Ourselves on FREE Estimates, Quality Workmanship with No High Sales Pressure. We’ve Been Roofing Homes & Businesses Since 2000. Best of The Bay Finalist and Winners for last 5 years.